"Waking the Feminists mobilised women and men in the arts, the media and beyond to publicly question and expose the mechanisms by which women have been excluded and marginalised"
In 2015, the Abbey Theatre announced their new season for 2016 called Waking the Nation. The season contained plays by Sean O’Casey, Frank McGuinness, Tom Murphy and three new plays by men, all deserving of inclusion. But the problem was that there were 18 men on the programme in terms of writers and directors and just two women - and all the plays were written by men, apart from one play referred to as a "monologue for children". In creating this programme, Ireland’s national theatre had privileged the male voice and excluded women and ethnic minorities. But, as journalist Sara Keating wrote, "women are not a minority". The narrative implied that female writers and artists were not considered good enough to create work for the national theatre. This was not just neglect, but a deliberate silencing of women. However, women were not silent or sleeping. Waking the Feminists was born to ensure that women’s voices were heard. A historic public meeting was held at the Abbey Theatre in Dublin on November 12th 2015. It was heart-breaking to hear woman after woman stand on the Abbey stage and speak about the great work they were making and the continuous discrimination they faced. But there was a groundswell of positive energy and active calls for change that went on to influence theatre in Ireland and internationally. #WakingTheFeminists was initially set up as a one-year grassroots campaign running from November 2015 to November 2016 and had huge success in advancing equality for women in Irish theatre. The movement was supported by women and men in Ireland and around the world with words of support sent by artists including Hollywood actor Meryl Streep. The first key event at the Abbey Theatre was chaired by Senator Ivana Bacik and Sarah Durcan with presentations from over 30 artists and cultural practitioners as well as contributions from the floor. Speakers included Lian Bell, campaign manager for Waking the Feminists, and Lucy Kerbel of Tonic Theatre in England, who spoke about her experiences to date working to establish gender equality within leading UK theatres. An interesting point made was that it was not enough to simply appoint women to various roles but that there was a need to appoint "feminist" women to ensure that genuine change took place. In 2016, the Arts Council of Ireland funded Waking the Feminists to commission a research document into gender balance in Irish theatre. Researchers Dr Brenda Donohue, Dr Ciara O’Dowd, Dr Tanya Dean, Ciara Murphy, Kathleen Cawley and Kate Harris created Gender Counts: An Analysis of Gender in Irish Theatre 2006-2015, a comprehensive research report on gender balance in Irish theatre over a 10 year period. Initial findings from the research were presented to the public on November 14th 2016 at the Abbey Theatre as part of an event titled One More Thing. The report focused on 10 of the top Arts Council funded organisations that produced or presented theatre in Ireland. Key findings stated that the four highest-funded organisations "have the lowest female representation...the higher the funding an organisation receives, the lower the female presence". Both the Abbey and the Gate Theatre had the lowest female representation among playwrights and directors. The report stated that "women are poorly represented in six of the seven roles studied, i.e. in every role except costume designer....only 28 percent of authors employed are women....only nine percent of sound designers employed are women." As a result, the Abbey appointed Sarah Durcan, a spokeswoman for Waking the Feminists, to their board and they announced that the Abbey Theatre "has developed a set of guiding principles to ensure that gender equality is both embraced and enshrined at the national theatre". Arising out of Waking the Feminists, 10 theatre organisations came together in 2016 to consider their own record in programming and supporting women within the theatre sector. Supported by the Department of Culture, Heritage and the Gaeltacht, they worked for a period of two years to discuss the development of their own gender policies with concrete "action plans and measurable results" to identify processes that would ensure gender parity and dignity at work into the future. The participating organisations were the Abbey Theatre, Cork Midsummer Festival, Corn Exchange Theatre Company, Druid Theatre, Everyman Palace Theatre, Dublin Theatre Festival, Fishamble: The New Play Company, the Gate Theatre, the Lir National Academy for Dramatic Art and Rough Magic Theatre Company. They agreed that gender disparities would be different for each organisation so they developed an individual gender equality policy document ratified by their board and each organisation undertook "to measure their progress against their published targets on an annual basis using the #WakingTheFeminists Gender Counts guidelines". The 10 policies were gathered into the Gender Equality in Practice in Irish Theatre document and was collectively launched by Josepha Madigan TD, Minister of Culture, Heritage and the Gaeltacht on July 9th 2018. In 2018, the Irish Theatre Institute, led by co-directors Jane Daly and Siobhan Burke, published Dignity in the Workplace: Towards A Code Of Behaviour for Irish Theatre. This was a discussion document aimed at generating a standard code of behaviour to be adopted across the theatre sector so that all those working in theatre can be clear as to their rights and obligations. The code of behaviour was developed as part of an initiative called Speak Up & Call It Out - Safeguarding the Future of Irish Theatre and was supported by the Department of Culture, Heritage and the Gaeltacht. An initial draft of the code was launched at Liberty Hall Dublin in March at an event attended by a range of Irish theatre organisations. In October 2018, the Irish Theatre Institute held a second meeting at the Project Arts Centre Dublin to discuss outcomes and feedback on the implementation of the code of behaviour for Irish Theatre. This meeting heard from practitioners and companies who have piloted the code in recent months to assess its effectiveness, implementation, suitability and value. Feedback was provided by artist and activist Veronica Dyas, Rough Magic artistic director Lynne Parker, Solstice Arts Centre director Belinda Quirke and Company SJ producer Kathryn Lennon. The event ended with a commitment from those present to ratify a formal adoption of the code and to work collectively to stamp out harassment, sexual harassment and bullying in Irish theatre. The purpose of putting an industry-wide code of behaviour in place is to proactively encourage a "zero tolerance" attitude towards abuse. It's to adopt a collective responsibility to call out harassment and discrimination and to support those who experience it; and to have a robust standard throughout the industry for how claims should be dealt with promptly, thoroughly and fairly. A key aim is to call on as many organisations as possible to adopt the code and put it into practice, with both women and men working together to ensure equality for all. Waking the Feminists mobilised women and men in the arts, the media and beyond to publicly question and expose the mechanisms by which women have been excluded and marginalised. Actions such as theatre organisations agreeing to gender-blind casting, having an equal balance of men and women on theatre boards, providing unconscious bias training for all staff in the workplace, the equal inclusion of female directors and playwrights and a more equitable gender balance in arts programmes play a key part in promoting gender equality in theatre. 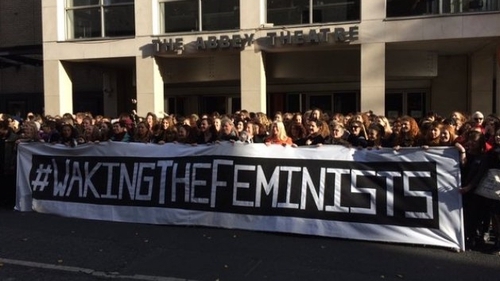 The immediate impact of Waking the Feminists was to prompt public statements from Ireland’s leading theatre organisations about their commitment to gender balance and equality and a government-led, industry-wide consultation on the issues. Perhaps more significantly, however, was the collective empowerment of women to challenge inequality and those in power and to ask the deeper questions of how women are viewed and treated in the theatre world and in society as a whole. The challenge now is to ensure this momentum continues and that structures to promote equality are not only agreed in principle, but are acted upon.